INSTANT ACCESS VIDEO & Quiz - No need to add to cart... TO PURCHASE and ACCESS IMMEDIATELY (or setup account for later use), click on the orange link near the PRICE above. 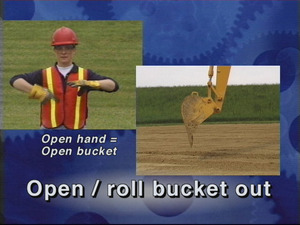 Video on Demand (VOD) training this video shows the SAE hand signals in use with various types of construction equipment in a clear concise manner. Visual use of the hand signals published as SAE J1307 Verbal explanation of the correct use of established hand signals. How the machine operator responds to clear signals, The effect of hand signals on safety, Situations where hand signals may be the best form of communication. Each video lesson can be viewed more than once, over several days or months. When you have a solid understanding of the lessons and are done viewing, take final test and print a certificate of completion with your name and score. Designed for self-study, but can be projected during a instructor-led class (one time per purchase).